The pattern of the movement of the planetary winds is called the general circulation of the atmosphere. The general circulation of the atmosphere also sets in motion the ocean water circulation which influences the earth’s climate. The air at the Inter Tropical Convergence Zone (ITCZ) rises because of the convection currents caused by low pressure. Low pressure in turn occurs due to high insolation. The winds from the tropics converge at this low pressure zone. The converged air rises along with the convective cell. It reaches the top of the troposphere up to an altitude of 14 km, and moves towards the poles. This causes accumulation of air at about 30° N and S. Part of the accumulated air sinks to the ground and forms a subtropical high. Another reason for sinking is the cooling of air when it reaches 30° N and S latitudes. Down below near the land surface the air flows towards the equator as the easterlies. The easterlies from either side of the equator converge in the Inter Tropical Convergence Zone (ITCZ). Such circulations from the surface upwards and vice-versa are called cells. 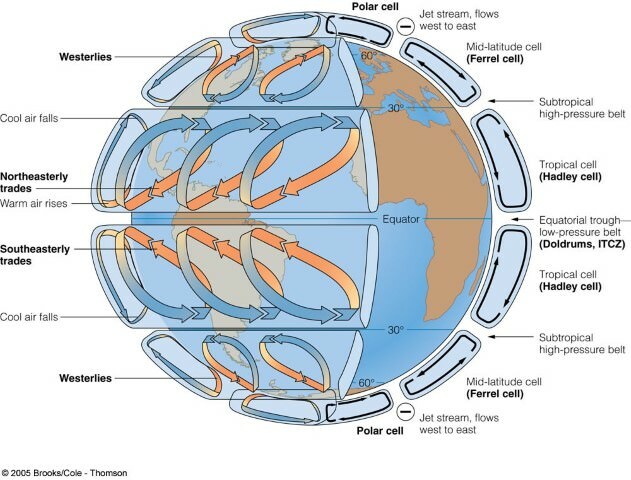 Such a cell in the tropics is called Hadley Cell. In the middle latitudes the circulation is that of sinking cold air that comes from the poles and the rising warm air that blows from the subtropical high. At the surface these winds are called westerlies and the cell is known as the Ferrel cell. At polar latitudes the cold dense air subsides near the poles and blows towards middle latitudes as the polar easterlies. This cell is called the polar cell. These three cells set the pattern for the general circulation of the atmosphere. The transfer of heat energy from lower latitudes to higher latitudes maintains the general circulation. The general circulation of the atmosphere also affects the oceans. The large-scale winds of the atmosphere initiate large and slow moving currents of the ocean. Oceans in turn provide input of energy and water vapour into the air. These interactions take place rather slowly over a large part of the ocean. Warming and cooling of the Pacific Ocean is most important in terms of general atmospheric circulation. The warm water of the central Pacific Ocean slowly drifts towards South American coast and replaces the cool Peruvian current. Such appearance of warm water off the coast of Peru is known as the El Nino. The El Nino event is closely associated with the pressure changes in the Central Pacific and Australia. This change in pressure condition over Pacific is known as the southern oscillation. The combined phenomenon of southern oscillation and El Nino is known as ENSO. 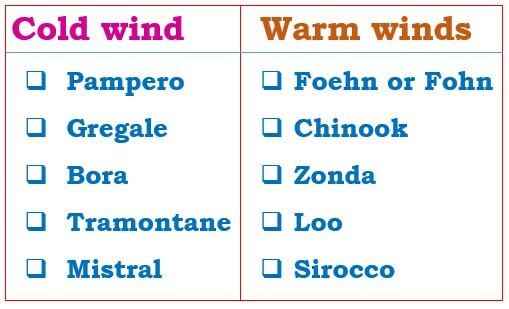 Seasonal winds: These winds change their direction in different seasons. For example monsoons in India. Winds like Loo, Mistral, Foehn, Bora. These are the planetary winds which blow extensively over continents and oceans. The two most well- understood and significant winds for climate and human activities are trade winds and westerly winds. The trade winds are those blowing from the sub-tropical high pressure areas towards the equatorial low pressure belt. They flow as the north-eastern trades in the northern hemisphere and the south-eastern trades in the southern hemisphere. This deflection in their ideally expected north-south direction is explained on the basis of Coriolis force and Farrel’s law. 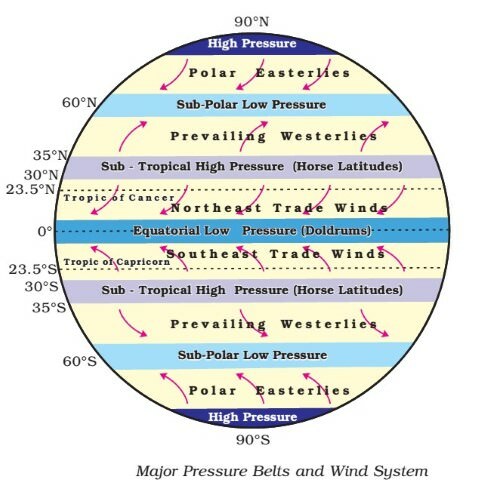 Trade winds are descending and stable in areas of their origin (sub-tropical high pressure belt), and as they reach the equator, they become humid and warmer after picking up moisture on their way. The trade winds from two hemispheres meet at the equator, and due to convergence they rise and cause heavy rainfall. The eastern parts of the trade winds associated with the cool ocean currents are drier and more stable than the western parts of the ocean. The westerlies are the winds blowing from the sub-tropical high pressure belts towards the sub polar low pressure belts. They blow from south­west to north-east in the northern hemisphere and north-west to south-east in the southern hemisphere. The westerlies of the southern hemisphere are stronger and persistent due to the vast expanse of water, while those of the northern hemisphere are irregular because of uneven relief of vast land-masses. The westerlies are best developed between 40° and 65°S latitudes. These latitudes are often called Roaring Forties, Furious Fifties, and Shrieking Sixties – dreaded terms for sailors. The poleward boundary of the westerlies is highly fluctuating. There are many seasonal and short-term fluctuations. These winds produce wet spells and variability in weather. 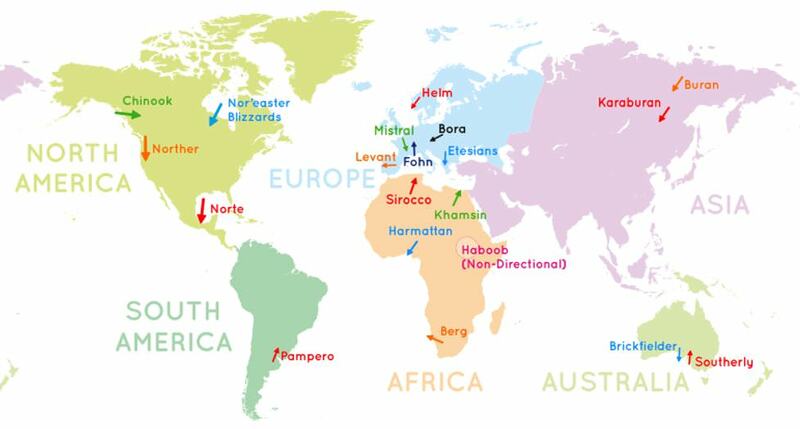 The Polar easterlies are dry, cold prevailing winds blowing from north-east to south-west direction in Northern Hemisphere and south-east to north-west in Southern Hemisphere. They blow from the polar high-pressure areas of the sub-polar lows. These winds change their direction with change in season. Monsoons are the best example of large-scale modification of the planetary wind system. Other examples of periodic winds include land and sea breeze, mountain and valley breeze, cyclones and anticyclones, and air masses. Monsoons were traditionally explained as land and sea breezes on a large scale. Thus, they were considered a convectional circulation on a giant scale. These winds now approach the Asian landmass as south-west monsoons. Since they travel a long distance over a vast expanse of water, by the time they reach the south-western coast of India, they are over-saturated with moisture and cause heavy rainfall in India and neighboring countries. During winter, these conditions are reversed and a high pressure core is created to the north of the Indian subcontinent. Divergent winds are produced by this anticyclonic movement which travels southwards towards the equator. This movement is enhanced by the apparent southward movement of the sun. These are north-east or winter monsoons which are responsible for some precipitation along the east coast of India. The land and sea absorb and transfer heat differently. During the day the land heats up faster and becomes warmer than the sea. Therefore, over the land the air rises giving rise to a low pressure area, whereas the sea is relatively cool and the pressure over sea is relatively high. Thus, pressure gradient from sea to land is created and the wind blows from the sea to the land as the sea breeze. In the night the reversal of condition takes place. The land loses heat faster and is cooler than the sea. The pressure gradient is from the land to the sea and hence land breeze results. 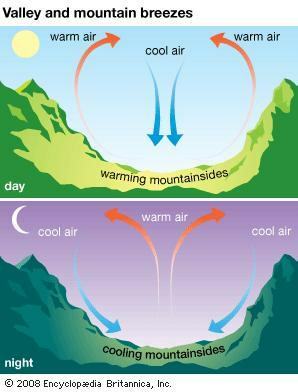 In mountainous regions, during the day the slopes get heated up and air moves upslope and to fill the resulting gap the air from the valley blows up the valley. This wind is known as the valley breeze. During the night the slopes get cooled and the dense air descends into the valley as the mountain wind. The cool air, of the high plateaus and ice fields draining into the valley is called katabatic wind. Another type of warm wind (katabatic wind) occurs on the leeward side of the mountain ranges. The moisture in these winds, while crossing the mountain ranges condense and precipitate. When it descends down the leeward side of the slope the dry air gets warmed up by adiabatic process. This dry air may melt the snow in a short time. Such winds are local in extent and are confined to the lowest levels of the troposphere. Some examples of local winds are discussed below. In the plains of northern India and Pakistan, sometimes a very hot and dry wind blows from the west in the months of May and June, usually in the afternoons. It is known as Its temperature invariably ranges between 45°C and 50°C. It may cause sunstroke to people. Foehn is a hot wind of local importance in the Alps. It is a strong, gusty, dry and warm wind which develops on the leeward side of a mountain range. As the windward side takes away whatever moisture there is in the incoming wind in the form of orographic precipitation, the air that descends on the leeward side is dry and warm (Katabatic Wind). The temperature of the wind varies between 15°C and 20°C. The wind helps animal grazing by melting snow and aids the ripening of grapes. It is beneficial to ranchers east of the Rockies as it keeps the grasslands clear of snow during much of the winter. Mistral is one of the local names given to such winds that blow from the Alps over France towards the Mediterranean Sea. It is channeled through the Rhine valley. It is very cold and dry with a high speed. It brings blizzards into southern France. Sirocco is a Mediterranean wind that comes from the Sahara and reaches hurricane speeds in North Africa and Southern Europe. It arises from a warm, dry, tropical air mass that is pulled northward by low-pressure cells moving eastward across the Mediterranean Sea, with the wind originating in the Arabian or Sahara deserts. The hotter, drier continental air mixes with the cooler, wetter air of the maritime cyclone, and the counter-clockwise circulation of the low propels the mixed air across the southern coasts of Europe. The Sirocco causes dusty dry conditions along the northern coast of Africa, storms in the Mediterranean Sea, and cool wet weather in Europe. While the pressure gradient force is from north to south, i.e. from the subtropical high pressure to the equator in the northern hemisphere, why are the winds north easterlies in the tropics. What are the geostrophic winds? 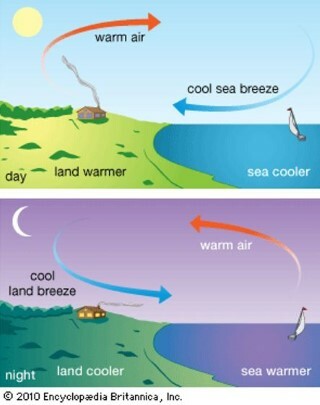 Explain the land and sea breezes. Discuss the factors affecting the speed and direction of wind. Draw a simplified diagram to show the general circulation of the atmosphere over the globe. What are the possible reasons for the formation of subtropical high pressure over 30° N and S latitudes? Why does tropical cyclone originate over the seas? In which part of the tropical cyclone do torrential rains and high velocity winds blow and why?